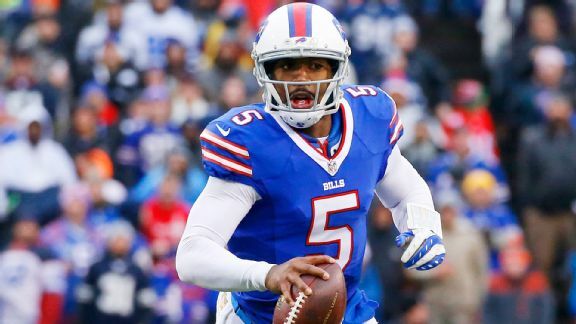 Finding a Quarterback: What is Tyrod Taylor’s Ceiling? Did the Buffalo Bills hold Tyrod Taylor back or was it the other way around? That’s the question I kept asking myself as I watched him play. There were times where Taylor was Russell Wilson. There were other times where I wondered if the Bills called conservative games because Taylor was their quarterback. This same debate is prevalent among Buffalo media, who are radically divided on Taylor’s tenure with the Bills. Buffalo GM Doug Whaley doesn’t like Taylor. Taylor was Rex Ryan’s guy and even though new Buffalo offensive coordinator Rick Dennison is said to be a fan of Taylor’s, Whaley isn’t like to care. Most signs point to the Bills opting out of Taylor’s lucrative contract and the 27-year-old hitting the open market. He’ll get paidt for his play the last two seasons, with passer ratings of 99.4 and 89.6, but nobody really knows what they’re getting. He could be a quality player on the ascent or he could be a player destined for mediocrity.